Yogyakarta (Javanese: ꦛꦔꦪꦺꦴꦒꦾ​ꦏꦂꦠ, occasionally pronounced or ; also Jogja or Jogjakarta, formerly Dutch: Djokjakarta/Djocjakarta or Djokja) is a city on the island of Java in Indonesia. It is renowned as a centre of education (Kota Pelajar), classical Javanese fine art and culture such as batik, ballet, drama, music, poetry and puppet shows. Yogyakarta City is the capital of the Yogyakarta Special Region and was the Indonesian capital during the Indonesian National Revolution from 1945 to 1949, with Gedung Agung as the president's office. 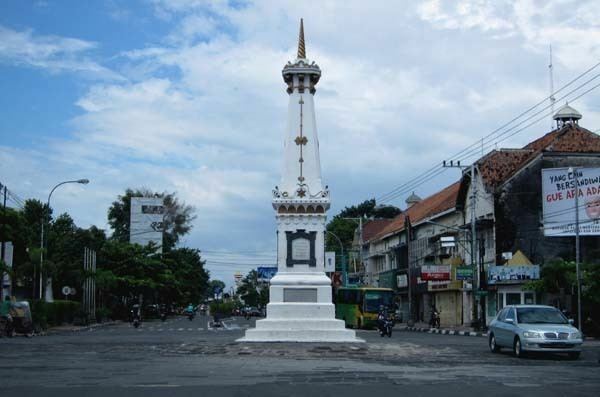 One of the districts in Yogyakarta, Kotagede, was the capital of the Mataram Sultanate between 1575 and 1640. The city is named after the Indian city of Ayodhya from the Ramayana epic. Yogya means "suitable, fit, proper", and karta, "prosperous, flourishing" (i.e., "a city that is fit to prosper"). Its population was 388,627 inhabitants at the 2010 census and its built-up (or metro) area was home to 4,010,436 inhabitants across two cities (Yogyakarta and Magelang) and 65 districts across Sleman, Klaten, Bantul, Kulon Progo and Magelang regencies. Yogyakarta-Magelang and Surakarta are being agglomerated in several years. Because of its urbanisation and modernisation, Yogyakarta has a very high HDI ranking nationally, being one of the highest in Indonesia as well; at 0.837 (or "very high"), on which it could be considered as a "developed" city. According to Canggal inscription dated 732, the area traditionally known as "Mataram" became the capital of the Medang Kingdom, identified as Mdang i Bhumi Mataram established by King Sanjaya. Mataram became the center of a refined and sophisticated Javanese Hindu-Buddhist culture, for about three centuries its heartland in Kewu Plain (southern slope of Mount Merapi) around Prambanan witnessed the construction of numerous candi including Borobudur and Prambanan. Around the year 929, the centre of the kingdom was shifted to East Java by Mpu Sindok, who established the Isyana Dynasty. The exact cause of the move is still uncertain; however, a severe eruption of Mount Merapi volcano or a power struggle probably caused the move. Historians suggest that, some time during the reign of King Wawa of Mataram (924–929), Merapi volcano erupted and devastated the kingdom's capital in Mataram. During the Majapahit era, the area surrounding modern Yogyakarta was identified again as "Mataram" and recognized as one of the twelve Majapahit provinces in Java ruled by a Duke titled 'Bhre Mataram'. During the reign of Hayam Wuruk (1350 to 1389), the title of Bhre Mataram was held by king's nephew and son in-law Wikramawardhana. Kotagede (now a district of Yogyakarta) was established as the capital of the Mataram Sultanate. During the reign of Sultan Agung Hanyokrokusumo (1613-1645), the Sultanate Mataram reached its zenith as the greatest kingdom in Java, and expanded its influence to Central Java, East Java and half of West Java. After two changes of capital, (Palace of Pleret and Place of Kerta, both located in Bantul Regency), the capital of Mataram Sultanate moved to Kartasura. During the reign of Pakubuwono II, a civil war broke out in Mataram Sultanate. The civil war was fought between Prince Mangkubumi and his elder brother, Sunan Pakubuwono II. It started when Sunan Pakubuwono II agreed to cooperate with the VOC, ceded some Mataram territory to the Dutch, and submitted to the foreign power. His younger brother, Prince Mangkubumi stood against the agreement due to concerns that his people would become slaves under Dutch rule. Prince Mangkubumi defeated the Pakubuwono forces and declared sovereignty in the Kingdom of Yogjakarta occupying the southern parts of the former Mataram Sultanate. The Yogyakarta Sultanate was established as a result of the Treaty of Giyanti (Perjanjian Gianti) by Prince Mangkubumi, who later ascended the throne as Sultan Hamengkubuwono I. Officially, the creation of Yogyakarta Sultanate is dated at 7 October 1756 as a result of civil war among the princes of The Mataram Sultanate. This civil war marked the end of the Mataram Sultanate and resulted in the birth of the Yogyakarta Sultanate and the Surakarta Sunanate. During the British occupation of Java, rumors of plans by the Javanese court to stage a rebellion caused uneasiness among the colonial authorities. On 20 June 1812, Stamford Raffles led a 1,200-strong British force to attack the royal city. The Javanese were surprised by the attack and were easily subdued. In one day the city of Yogyakarta fell, with the city destroyed and its palace looted. The event completely stripped the sultanate of its remaining power and influence. The sack also left the court humiliated and fueled a rebellion which would be known as Java War. In 1942 the Japanese Empire invaded Dutch East Indies and ruled Java until they were defeated in 1945. Sukarno proclaimed the independence of the Indonesian Republic on August 1945. Sultan Hamengkubuwono IX promptly sent a letter to Sukarno, expressing his support for the newly born nation of Indonesia and acknowledging the Yogyakarta Sultanate as part of the Indonesian Republic. The Sultanate of Surakarta did the same, and both of the Javanese kingdoms were awarded special status as "Special Regions" within the Indonesian Republic. However, because of a leftist anti-royalist uprising in Surakarta, the Sunanate of Surakarta lost its special administrative status in 1946 and was absorbed into Central Java Province. Yogyakarta's support was essential in the Indonesian struggle for independence during the Indonesian National Revolution (1945-1949). The city of Yogyakarta became the capital of the Indonesian Republic from 1946 to 1948, after the fall of Jakarta to the Dutch. Later the Dutch also invaded Yogyakarta, causing the Republic's capital to be transferred once again, to Bukittinggi in West Sumatra on 19 December 1948. Because of its significant contribution to the survival of the Indonesian Republic, Yogyakarta was given the status of Special Administrative Region, making Yogyakarta the only region headed by a monarchy in Indonesia. The area of the city of Yogyakarta is 32.5 square kilometres (12.5 square miles). While the city spreads in all directions from the kraton (the Sultan's palace), the core of the modern city is to the north, centered around Dutch colonial-era buildings and the commercial district. Jalan Malioboro, with rows of pavement vendors and nearby market and malls, is the primary shopping street for tourists in the city, while Jalan Solo, further north, is a shopping district more frequented by locals. 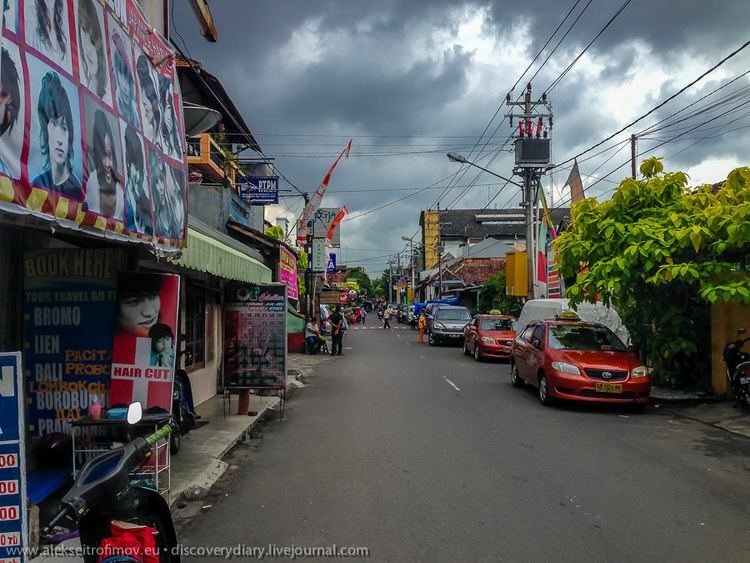 At the southern end of Malioboro, on the east side is the large local market of Beringharjo, not far from Fort Vredeburg, a restored Dutch fort. At Yogyakarta's centre is the Kraton, or Sultan's palace. Surrounding the kraton is a densely populated residential neighbourhood that occupies land that was formerly the Sultan's sole domain. Evidence of this former use remains in the form of old walls and the ruined Taman Sari, built in 1758 as a pleasure garden. No longer used by the sultan, the garden has been largely abandoned. For a time, it was used for housing by palace employees and descendants. Reconstruction efforts began in 2004, and an effort to renew the neighbourhood around the kraton has begun. The site is a developing tourist attraction. Nearby to the city of Yogyakarta is Mount Merapi. The northern outskirts of the city run up to the southern slopes of the mountain in Sleman Regency (Indonesian language–Kabupaten). Gunung Merapi (literally "mountain of fire" in Indonesian/Javanese), is an active stratovolcano located on the border between Central Java and Yogyakarta, Indonesia. It is the most active volcano in Indonesia and has erupted regularly since 1548. The South Of Merapi is Kaliurang Kaliurang Park. The volcano last erupted in November 2010. Climate in Yogyakarta features tropical wet and dry climate (Aw) as the precipitation in the driest month, August is below 60 millimetres (2.4 inches). The wettest month in Yogyakarta is January with precipitation totalling 392 millimetres (15.4 inches). The climate is influenced by the monsoon. The annual temperature is roughly about 26 to 27 Celsius. The hottest month is April with average temperature 27.1 Celsius. The city of Yogyakarta is an administrative part of the Yogyakarta Special Region which has the status of a province in Indonesia. The regencies of Bantul and Sleman have population densities far higher than the surrounding countryside (over 1,500 per square kilometer) and are effectively dormitory communities of the greater area of Yogyakarta. Within the greater Yogyakarta area lies the city of Yogyakarta called Kota Yogyakarta. Yogyakarta Special Region having 4 regency and 1 city: 1. Kulon Progo the capital is Wates 2. Sleman the capital is Sleman 3. Bantul the capital is Piyungan 4. Gunung Kidul the capital is Wonosari and 5. Yogyakarta City. The Gross Domestic Product of Yogyakarta in 2014 reached Rp 24.69 trillions with the economic growth rate is 5.30 percent. Meanwhile, the average economic growth during the period 2010-2014 reached 5.51 percent per year. The GDP per capita is Rp 60.57 million. Yogyakarta economy heavily relies on tertiary sectors, such as wholesale and retail trade; transportation and warehousing; tourism; information and communication sector; insurance and financial services; real estate; corporate services; government administration; education services; health services which all of them contribute 77.19 per cent of total GDP. A large majority of the population are native Javanese. However, as a city with large numbers of schools and universities and relatively low cost of living compared to other Indonesian cities, Yogyakarta has attracted large numbers of students from all over Indonesia. As a result, there are many other Indonesian ethnic groups living in Yogyakarta, especially from eastern parts of Indonesia. Yogyakarta attracts large numbers of foreign visitors. However, there are also significant numbers of foreign people residing in the city. Most of them are foreign students that usually stay to learn Indonesian or Javanese culture. Because of its proximity to the Borobudur and Prambanan temples, and because of the Javanese court Kraton culture of Kraton Yogyakarta, Yogyakarta has become an important tourist destination in Indonesia. 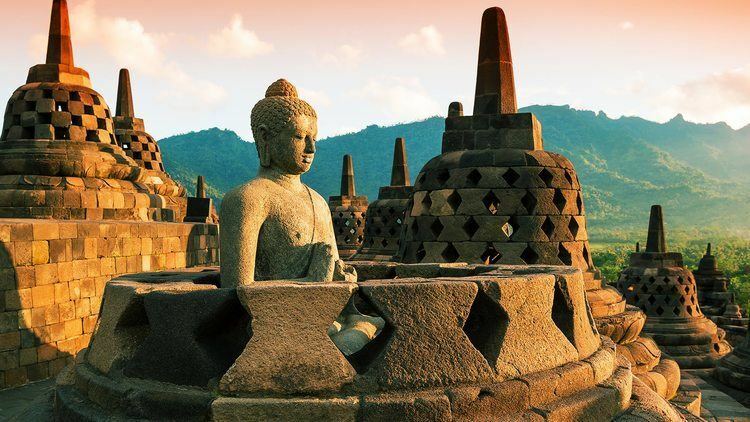 Most tourists come to Yogyakarta as an accommodation base to visit Borobudur and Prambanan. At tourist sites, you may meet high school students who look forward to have a conversation in English with you to polish their language skills.